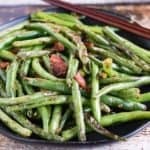 I love the Chinese Dry Fried Green Beans I get at my local Sichuan restaurant. They are super garlicky and studded with bits of ground pork. When I make this dish at home, though, I like to use bacon. Because, well, obviously …. bacon. I like my green beans pretty spicy, but you can cut down or eliminate the chili paste if you want a milder dish. Heat a large, heavy skillet over medium-high heat. Add the bacon and cook, stirring, until browned and crisp. Transfer the bacon to a paper towel-lined plate and drain off the excess bacon grease (leave just enough to coat the bottom of the pan). Add the green beans and salt to the pan and cook, stirring, until they begin to blister and brown, 6 to 8 minutes. Add the sesame oil and toss the green beans to distribute it throughout the pan (which by now is probably dry.) Add the garlic and ginger and return the bacon to the pan. Cook, stirring, for about 1 minute. Add the chili paste and soy sauce and stir for about 30 seconds more, until well combined. Remove from the heat and transfer the beans to a serving platter. Serve hot.